A small bunch of asparagus spears , tough ends removed, then cut lengthwise into 3/4-inch pieces (store the tough ends for vegetable stock). Bring a large pot of water to boil. Dunk in the kale leaves. Bring the water back to a boil and let the kale leaves cook for five minutes. Then, using a pair of tongs, fish out the kale leaves and set them aside. Bring the water to a boil again and add your pasta. About five minutes before the pasta is cooked, add the chopped asparagus. Meanwhile, assemble the pesto. Place the cooked kale, 1/2 cup of toasted walnuts, nutritional yeast, miso, garlic and olive oil in a food processor or blender. Process into a paste. I processed mine pretty smooth this time, but you can leave it coarse if you like your pesto that way. 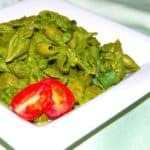 The jewel-green color of this sauce has to be seen to be believed-- it's just gorgeous. Mix the pesto, cooked pasta and asparagus, lemon juice, and remaining walnuts in a large bowl. Add salt and pepper to taste, if desired.